The documents and materials presented at nobelprize.org are generally protected by copyright and related rights or as trademarks and trade names. For use of such material, permission in writing from Nobel Media or the Nobel Foundation is required. Reproductions – copies – made by private persons for private use of protected works. Creation of links from documents on other servers to any document at nobelprize.org. Nobel Media appreciates being informed of such links. It is, however, not permitted to include content from nobelprize.org into other websites using frames or similar techniques, or by using page elements from nobelprize.org. You are allowed to link to complete html pages on nobelprize.org and not directly to images, videos, games, etc. that display the content out of its context. You are allowed to insert iFrame widgets supported by nobelprize.org. You are not allowed to alter the original content. Nobel Media provides these iFrame widgets as a convenience for you, but is not responsible for the content on the referring site or application. Use of the press releases from the Nobel Foundation and the Nobel Prize-awarding institutions, with the exception of logotypes and Nobel Prize design marks (“the Nobel Prize medals”) (see below). Permission to use an image or a photo of a Nobel Medal is only granted if the image is going to be used as an illustration to an editorial text about Alfred Nobel, the Nobel Prize or a Nobel Laureate. An image of the Nobel Prize medal may, however, not be used on the cover of books, booklets or other printed matter, on posters, in exhibitions etc., nor for publicity or commercial purposes. To apply for a permit, contact Nobel Media. If permission is granted, “®© The Nobel Foundation” must be indicated. For uses of photos, other than those of a Nobel Laureate, permission from the Nobel Foundation or Nobel Media, and in certain cases, from the photographer, is required. To apply for a permit for a photo with © The Nobel Foundation or © Nobel Media, please contact Nobel Media. If permission is granted, either “© The Nobel Foundation” or “© Nobel Media” must be indicated. The Nobel Foundation can unfortunately not grant permissions to use portrait photos of the Nobel Laureates of 1901–2006 due to copyright restrictions. We refer you to a photo agency such as Sciencephoto.com, Scanpix, Reuters, Associated Press, Getty Images or Agence France Presse to make your enquiry for other photos. Where applicable, the university or institution to which the laureates were affiliated at the time of the award may be of assistance in providing photos. Please find information regarding such affiliations in the biographical information of each Nobel Laureate. Starting in 2007, most of the official Nobel portraits on nobelprize.org are taken in Stockholm, with full copyright held by the Nobel Foundation. Please contact Nobel Media if you wish to inquire about editorial use of these photos. The artists and calligraphers of the Nobel diplomas have granted the Nobel Foundation the rights to these materials. To use a reproduction of a Nobel diploma, permission has to be granted by the Nobel Foundation. To apply for a permit contact Nobel Media. If permission is granted, “© The Nobel Foundation” and the specific artist and/or calligrapher must be indicated. Nobel Media administrates the publishing rights of the Nobel Lectures, speeches and biographies on this site on behalf of the Nobel Foundation who hold copyright. For information on how to license these, please contact Nobel Media. For use of an article, permission from Nobel Media, and in certain cases also from the authors, is required. To apply for a permit contact Nobel Media. If permission is granted, “© Nobel Media” and in certain cases the name of the author must be indicated. 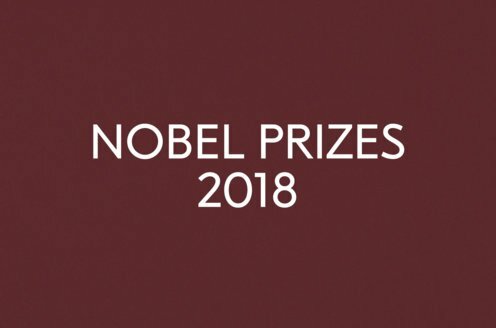 For use of the Nobel posters in Physics, Chemistry, Physiology or Medicine and Economic Sciences, permission from the respective Nobel Prize-awarding institution is required. To apply for a permit, contact reception@kva.se (Physics, Chemistry and Economic Sciences posters), or Nobelforum@nobel.se (Physiology or Medicine poster). Texts from press releases and other press material, such as advanced information and public information, can be used, whereas the use of logotypes and Nobel Prize design marks are not permitted. On all publications in full or in major parts the copyright notice must be applied as well as the source, https://www.nobelprize.org/.